Onion is popular food in the world. Onion consists of vitamin B and C, folic acid and dietary fiber which are useful for our health. People use it in many dishes to make them tastier and more attractive. 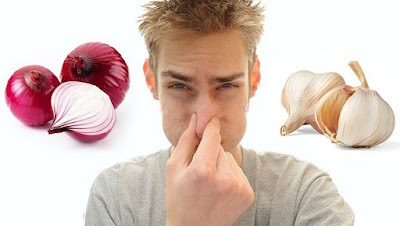 Eating onion not only has advantages but also some disadvantages. Onion breath is one of the problems. It makes you feel uncomfortable and unconfident when communicating with each other. While stopping eating is not a good choice and you find home remedies for onion breath quickly and naturally. Eating raw onion brings onion breath for user because the sulfurous compounds in onion make breath odorous. Some following solutions we can use at home to get rid of onion breath. Green tea is good drink for people and also a treatment for onion breath. It contains polyphenols, powerful antioxidants which eliminate the sulfurous compounds existing in onion. It is good home remedies for onion breath. With a cup of hot water, boiling water is the best, include a teaspoon of the leaves in five minutes. Purify the water and add some honey and drink it with several times per day, depending on your onion breath. Natural enzymes in apple is capable of smashing up sulfur compounds and help address onion breath after eating raw onion. One of effective home remedies for onion breath must be apples. There are two ways to stop onion breath: you can eat apple after using food or drink apple juice. Helping neutralize the onion in your mouth is the flavor of lemon. Moreover, antibacterial properties in lemon can kill the bad bacteria bring onion breath. The simplest way is to drink glass of lemonade to get rid of onion breath. Another option is to chew a lemon peel making onion disappear. Milk is another effective way to remove onion breath that we should use. The fat in milk which can neutralize sulfur in onions one of the causes onion breath. To get the better results, you should use full-fat milk instead of skim milk. Drink a glass of milk before or during a meal that has onions to eliminate onion breath naturally. Cinnamon is one of the best alternatives to deal with onion breath at home because of its antifungal and antibacterial qualities. You can make tea with cinnamon to drink or another home remedies for onion breath is just eat cinnamon with yogurt. Chlorophyll in mint can freshen onion breath. In addition, antiseptic properties present in mint are useful for bad health. Choosing mint to make onion breath disappear is perfect. You can add mint leaves into a cap of hot water in ten minutes, drink this tea to stop onion breath. A simple way is to chew mint-flavored or gums to remove onion odor. Drinking water is one of the most natural home remedies for onion breath. Water is used enough can help saliva in your mouth work effectively, which ease all bacteria. Therefore, using water regularly to stop onion breath is a good choice. Eating yogurt regularly is not only good for digestive system but also can help you to get rid of onion breath quickly. You can eat yogurt after your meal to have a fresh breath, make onion smell keep away from your mouth. Another of effective ways to eliminate onion breath. You can use toothpaste which contains mint to prevent onion smell from your breath. Removing onion breath by brushing your teeth can make you fresh and confident. Health benefits of baking soda are incredible since it is one of the best home remedies for onion breath instead of stopping eating onions. It can neutralize onion odor and protect you from bacteria. You can use it at home by adding one teaspoon of sea salt and baking soda into a lukewarm water. This liquid is a good mouthwash to remove onion breath. There are many home remedies for onion breath which is quick and easy to do by yourself. Don’t worry about eating onion because ten tips above can help you every time.